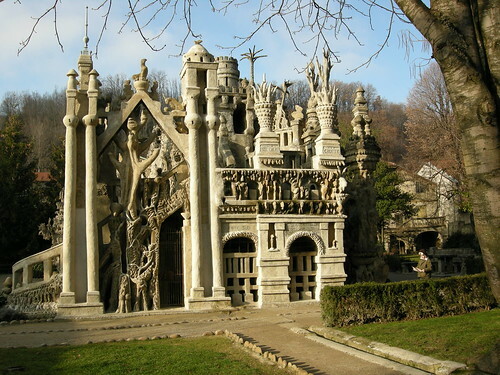 Ferdinand Cheval, a French postman in the commune of Hauterives, France, built this palace all by him self. He was neither a mason nor an architect. He started building when he was 43 years old. Reportedly during his beat as postman he tripped on a large stone and was fascinated by its shape. He returned to the place next day and found several stones with unusual shapes. He carried a few to his place and started to build the palace from his imagination. He used to collect stones during his round as postman and built the palace in his free time working even in the night in the glow of a kerosene lamp. Initially he used to carry the stones in his hand, then in a basket and finally in a wheel barrow. The stones were joined by lime mortar and cement. It took him 33 years to complete the palace. 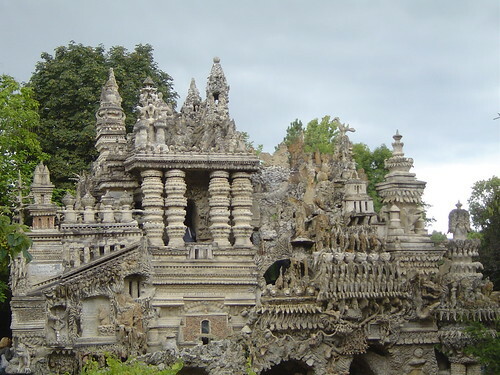 The building was initially known as Temple of Nature but was later renamed Le Palais Idéal (The Ideal Palace). Each facade of the palace is thematic - Source of Life, Source of Wisdom, Monument of Egypt, Temple of Nature, statues of horse and some wildlife, exotic flora, giants, mummies and assortment of large alcoves depicting a Muslim mosque, a Hindu temple, a Swiss chalet, a castle of Middle Ages etc. There is also access to a gallery of twenty meters long, deep in the Palace and decorated with sculptures. 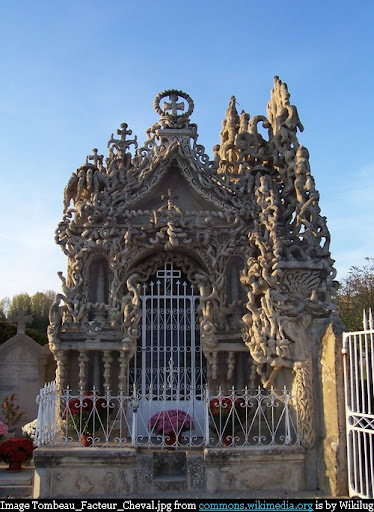 He wanted to be buried in his palace but the law didn't permit it so he also built, again all by himself, his own mausoleum (shown above) in the town's cemetery. He called it Le Tombeau du silence et du repos sans fin (The Tomb of silence and rest without end). It took him another 8 years to build the mausoleum. He died about a year after he had finished it and he is buried there. 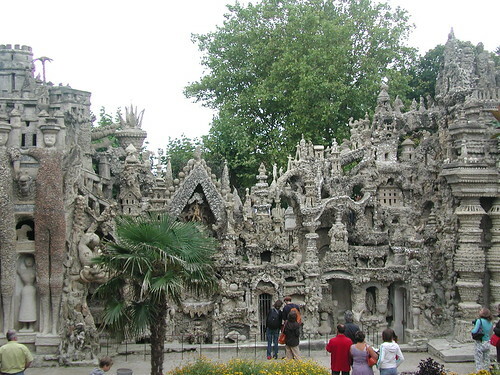 Ferdinand Cheval is really amazing! Thank you for the link to my blog Leaves of Grass. You have a great and beautiful blog! Thanks again for your visiting and for the link to Leaves of Grass. Regards from Sonia, São Paulo, Brasil. PS: I will add your blog on my "Blog I Like to Visit". The main credit for my blog is to all those who post their images under Creative Commons license, which includes you also.